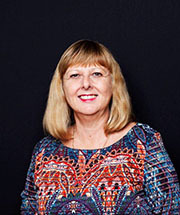 Professor Deborah Sweeney is the Deputy Vice-Chancellor (Research and Innovation) at Western Sydney University. She provides leadership and guidance to achieve the University’s strategic priorities for research and innovation and focuses on quality assurance and enhancement. In addition, she is responsible for supporting the research portfolios of the University's schools and institutes. Deborah joined Western Sydney in 2009 and has more than 20 years experience in research and research management. She received her Bachelor of Optometry from UNSW in 1980, joining the Cornea and Contact Lens Research Unit within the School of Optometry, UNSW. Since completing her PhD in 1992, she has held various executive roles within the Cornea and Contact Lens Research Unit and Vision CRC and its predecessor the CRC for Eye Research and Technology, including five years as Chief Executive Officer of Vision CRC. Deborah's major research area has been corneal physiology. Her work has been instrumental in developing an understanding of the physiology of the human cornea and the effects of contact lens wear and refractive surgery on corneal function characteristics and the development of alternative forms of vision correction. She has published over 100 refereed articles and several book chapters, and is co-inventor on two patents.